We are committed to making the memories of your wedding ones that you will cherish for a lifetime. We will make every effort possible to provide you with outstanding designs and quality products at a reasonable price. We are ranked as Corvallis' #1 florist for good reason. We have been serving the Corvallis, Philomath and Albany area with quality flowers from all over the world for 24 years. We're ranked by FTD® in the Top 50 florists in the world and #1 in the Pacific Northwest. Let us help you in planning the wedding of your dreams! Our Wedding Flower Calculator is a useful tool we've created to help give you an idea of what your flowers will cost. 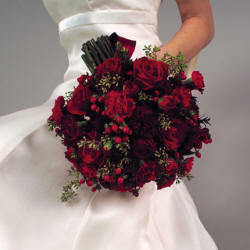 You will find a category for economy flowers, most popular flowers and more expensive flowers. Click here to learn more about using the calculator. Expressions In Bloom and Corvallisbride.com offers local delivery of flowers, roses, floral arrangements, gift baskets, balloon bouquets, and many other great gifts in Corvallis and Albany, we also offer a large selection of wedding flowers for your special day in Corvallis, Albany, or Philomath and the entire surrounding area. Trust a name you know in Corvallis or Albany with your wedding flowers, just as you would with your ring or your wedding dress, take as much care with your bridal bouquets and wedding celebration flowers. We are the premier local florist in the area for a good reason - thousands of happy customers! Stop in in person to browse our great selection of floral guides and talk to our professional wedding designer for help planning the wedding of your dreams.